Flying, without a doubt, is the safest and the fastest way of transportation. It makes the economy of the state, and the lives of the people running at a steady pace. I couldn't imagine life without air transportation. Today, more and more people choose to fly due to lower airfare, most especially when airline tickets are on sale. Working in the aviation field gave me an opportunity to understand on how this industry really works. More so, as a frequent flyer, I always encounter or hear a LOT of scuttlebutts about flying. Here are the five misconceptions and facts about flying. 1) "I'd rather be on a jet rather than on a turboprop flight; the former is safer than the latter." If an aircraft, regardless if it is powered by jet engines or propellers, is deemed unsafe for operations, it wouldn't be operating in the first place! Both have turbine engines and they run on same mechanics, only that jets have turbine engines encased with fan blades while turboprops have propellers on the outside. Turboprops are designed for short-haul routes and for destinations that have shorter runways, like in Caticlan (Boracay), Busuanga, Basco, and Camiguin. Turboprops may carry less passengers than jets but they provide extra drag upon landing due to their propellers. In a nutshell, BOTH are safe. Enough said. Myth busted! 2) "Why did the airline leave me? I paid a thousand bucks for this flight. I have the right even if I arrive 30 minutes before the flight. I still have the time! I will sue your company! I demand trial by combat!" If you went through web check-in, the airline company will still accommodate you by issuing a boarding pass. If not, standard departure protocols state that departing passengers are required to check-in 2 HOURS (3 hours for an international flight due to additional processes) before their scheduled flight. Check-in counters will close 45 minutes prior the estimated time of departure. It is your responsibility to arrive at the airport before the check-in counter closes. Creating a dramatic scene at the check-in counter won't help you either. 3) "I'd rather book a flight on this airline because they are not prone to delays compared to others." Here in the Philippines, all Manila-inbound flights, regardless of the airline are subjected to EDCT (Estimated Departure Clearance Time). This slotting procedure controlled by the Manila ATFM or Air Traffic Flow Management aims to ease the congestion of arrival traffic. They call it GDP or the ground delay program. It's better to hold on the ground rather than holding on air, which is less economical. Because NAIA only use one runway (RWY 06/24) for all arriving IFR flights, the airport is only capable of handling 21 landings per hour. Now, this is the scenario WITHOUT the slotting and the ground delay program: During peak hours, sometimes there are more than 21 scheduled arrivals, say 25. Obviously, the last 4 will be subjected to a holding procedure and these 4 aircraft will be arriving the next hour. If the second hour has 26 scheduled arrivals, there is an additional six aircraft that will be delayed due to air traffic congestion. Add that up and that would be 10 delayed arrivals. These delays would create a domino effect, affecting all scheduled turnaround flights. 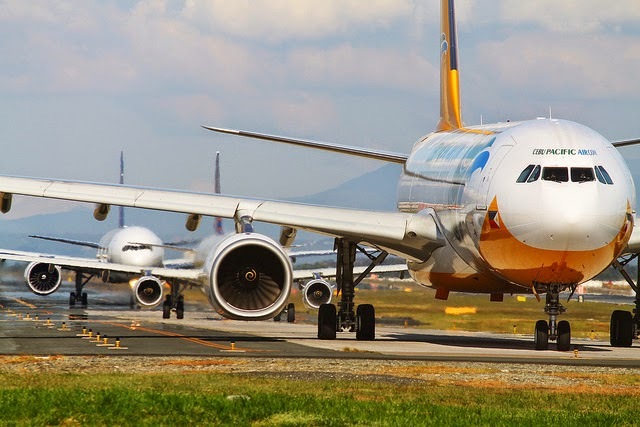 Whether you're flying with Airline A or Airline B, a scheduled arrival or departure in and out of Manila will always be subjected to delays, unless if you're the President of the Republic of the Philippines. That was base from my actual experience a couple of years ago. I was onboard an Airbus A320-200 flight to Manila and the passenger right in front of me complained that the aircraft was too 'small' for an Airbus. For those who didn't know, there are several aircraft manufacturing companies in the world, and Airbus is one of them. 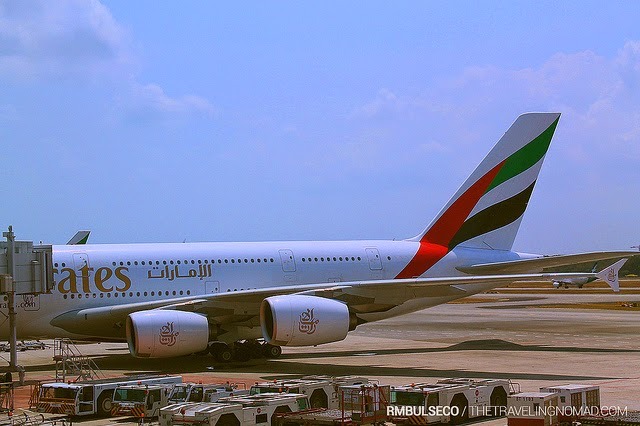 Airbus has a long list of fleet, ranging from the medium sized A319/A320 to the gargantuan Airbus A380. Early 2001. I saw a Philippine Airlines Airbus A330-300 on short finals of Davao's RWY 05. Schoolmate: No, hindi yan Airbus kasi galing Manila lang yan. Hindi kasi yan international. (No, it's not an Airbus since it came from Manila. It's not an international flight). 5) "I don't want to fly Airline One because their flights are susceptible to turbulence than Airline Two." Unless if an airline is managed or better yet powered by God, your favorite airline will always be susceptible to turbulence. If there's a storm along your assigned airway, your flight will experience turbulence and pilots will try their best to avoid it. Trust me, we ATCs and pilots HATE weather build-up. Even on clear and sunny weather, you'd still experience mild turbulence caused by thermals or bubbles of warm air which would later develop into a thunderstorm. When you're flying over mountains, expect some turbulence too as the mountain blows the wind over its ridges. These winds create up and downdrafts, which causes different wind currents going against each other. It is true though that you'll feel the turbulence more on smaller aircraft than the larger ones due to the weight and size difference. It is similar to taking out a smaller boat and hitting large waves versus a cruise ship going over those same waves - on larger boats, you wouldn't feel it. Therefore, it is really unfair to blame the pilots for a turbulent flight. They are trained NOT to fly directly into it. Instead, they aim for the smoothest ride by doing some maneuvers. The next time you're flying, don't forget to thank the pilots, the ATCs on duty, the ground staff and marshall, and the cabin crew for making your flight experience a comfortable one, despite and in spite of. We shall be taking off shortly. So please, straighten up your seats, make sure your seatbelts are securely fastened, window shades up, and tray tables stowed. Thank you, and welcome aboard. Airplane yan kasi domestic. Airbus kapag international. FTW! I love item #4. sana dagdagan mo pa ng stories. hahaha yeah i can remember you updated a status on that situation. airbus vs small plane. lol! So I learned a few things. Thanks! Also, I hope people who think Nos. 4 and 5 don't reproduce. No excuses to be that ignorant. Lol. @Arlene maka frustrate din. Hahaha! Very informative... Whether by land or by air, or even by train, when accident happens no one is exempted for not being affected or victimized. Who can guarantee the safety of everyone, though precautionary measures are being highly maintained, but yet none could guarantee it. Only God knows on what to do for his faithfuls. We're the only airport though that requires 2 hours/3 hours for check in. So I've noticed in international airports, only the Manila line has that habit because this has already become a habit.